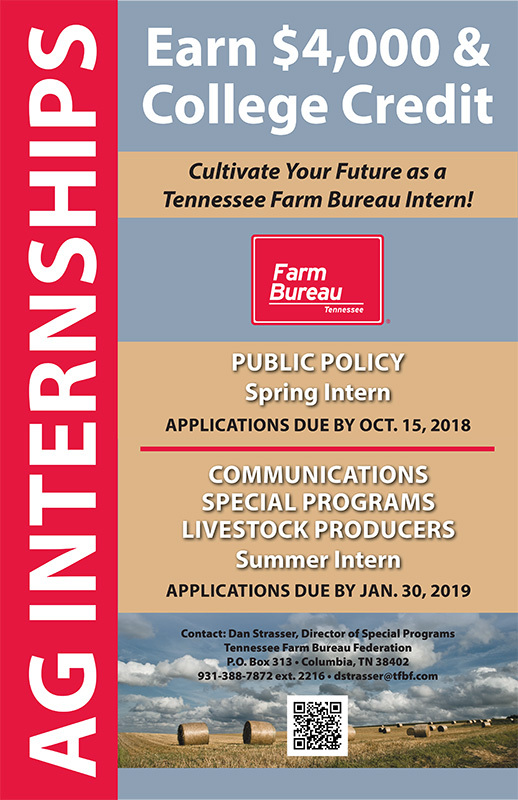 The Farm Bureau Summer Intern Program is available to Juniors and Seniors enrolled in one of the following universities: The University of Tennessee at Knoxville, Tennessee Technological University, Middle Tennessee State University and The University of Tennessee at Martin. This is a twelve-week position for the summer established by the Tennessee Farm Bureau Federation. The intern will be paid $4,000.00 for the 12 weeks of work, plus travel expenses incurred when traveling for TFBF. The candidate selected will be working from the office of Tennessee Farm Bureau Federation in Columbia, Tennessee. Some long hours, evening and weekend work will be required during special events and activities. VII. Public Policy applications due October 15. Other applications due January 30. Interviews will be scheduled in Columbia.